Picked up the tshirts for the convention the other day. They are awesome! Well, I like them anyway, hopefully that means everyone else will to! Thanks to Mel for the design. If you are in town early for the SJC on Wednesday, make sure you get yourself down to Newtown Jugglers between 7:30 and 9:30. If we are lucky there may be extra special guests…I hope Julian has bought some quality cookies! Ok, so the SJC 2012 is almost here! Can’t wait to catch up with old juggling friends, and make some new ones too! The lineup for the Sirkus Circus is complete and it’s looking like it is going to be amazing again. How could it not be with great performers like Get the Shoe (Germany), Markus Furtner (Germany), Jeanine Ebnother(Switzerland) Bikerina (Germany) as well as local faves The Birdmann, Jess Ward, Neisha Murphy, Anna Fisher and Byron Hutton. The venue is seated so it is good to pre buy your tickets to make sure you get the best seats. It would be great to have a full house so make sure you invite your non-juggling friends too! 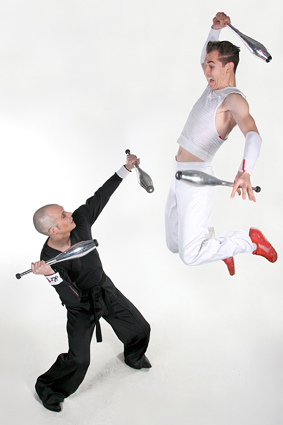 The SJC will feature all the usual faves, workshops, renegade, games and don’t forget that on the first night (26th) we will be continuing the first day juggling fun at the welcome BBQ in the park.